Savannah Edwards, 2-years old, was killed by a rescue pit bull near Topeka. UPDATE 12/16/12: A Sunday article by the Topeka Capital-Journal clarifies the history of Shawnee County. The county has never had a breed-specific ordinance, though the City of Topeka, which is the county seat of Shawnee County, once did. Topeka repealed the ordinance in 2010 and now boasts a "behavior-based" ordinance rather than a "breed-based" one. Savannah Edwards was killed by a "rescue" pit bull in Shawnee County, outside of Topeka city proper. The child was visiting a relative with her mother on Thursday at a home on Cross Street when a rescue pit bull belonging to a tenant of the residence attacked. 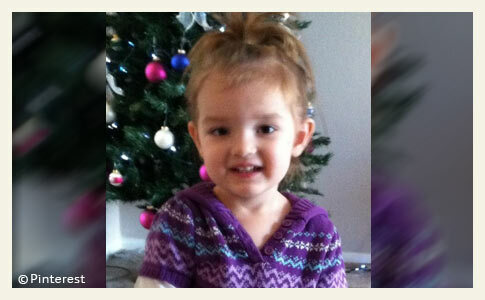 Savannah was rushed to a hospital in Topeka, but did not survive. There is still no information about how long the pit bull had lived at the residence or what shelter it came from. The family has requested the media not contact them. As of Sunday, the Shawnee County Sheriff's Office also has not released this information. WIBW.com shows footage of the red-nosed rescue pit bull being directed into the county animal control vehicle and interviews several neighbors. 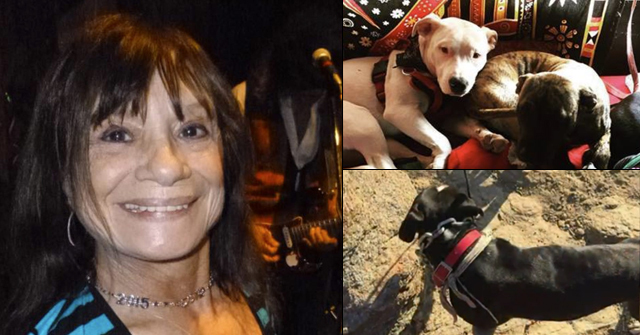 Ruth Courville, who is new to the neighborhood, told the news group she had only seen the dog one time and it appeared amicable. Neighbor's who did not want to appear on camera, however, told WIBW that the owner warned them that his "rescue" pit bull was dog-aggressive and that it would attack other dogs if given the chance. Exactly in what neighborhood is a dog-aggressive pit bull -- "would attack other dogs if given the chance" -- appropriate? Your neighborhood? Your mother's neighborhood? 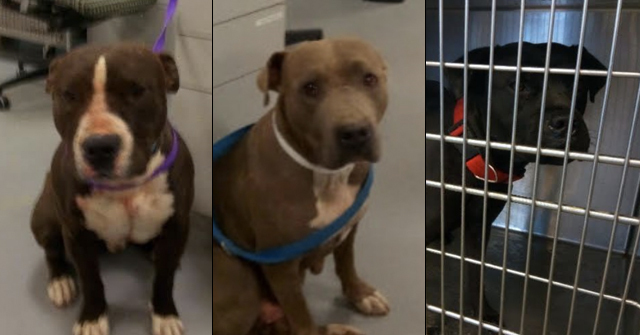 The shelter or rescue that adopted out this dog-aggressive pit bull has still not been named, but it hardly matters given that there are hundreds of these entities across the U.S. that do the same thing everyday. Such groups have "zero" concern about the dangerousness these dogs pose to neighborhoods. In this case, the "neighborhood suitable" dog-aggressive pit bull was also human-aggressive and struck down the life of an innocent young child. It's bad enough to place a neighborhood's beloved pets at risk with these types of dogs, which by default also places their owners at risk who will and do receive serious and sometimes fatal injuries trying to save their pet when under attack. 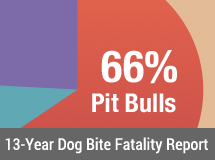 This risk shoots off the charts when it comes to dog-aggressive pit bulls, a breed of dog already artificially engineered through selective breeding for explosive dog aggression for the sole purpose of attacking and killing dogs in a fighting pit. After publishing this post Friday night, the WIBW news story was updated to include the identification of the victim. 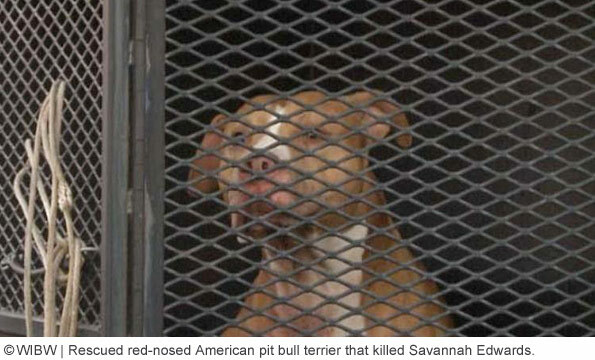 Savannah Edwards, 2-years old of Topeka, Kansas is the 207th American killed by a pit bull since the CDC stopped tracking deaths by dog breeds in 1998. Topeka, KS - A 2-year old girl who was attacked by a pit bull on Thursday has died from her injuries. Earlier reports said the child was airlifted to a Topeka hospital with life threatening injuries. 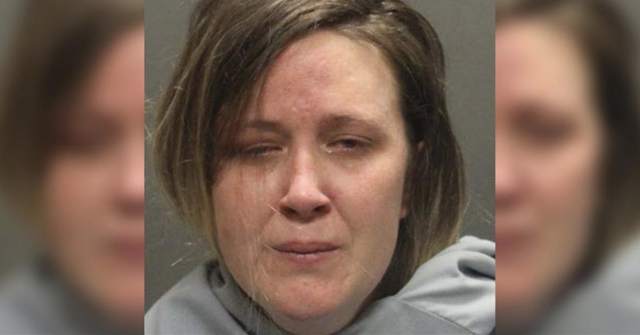 The little girl and her mother were visiting a tenant when the tenant's dog suddenly attacked the girl. The tenant is related to the child's mother. Authorities said the dog is a 6-year old male "pit bull-mix. "1 The dog was adopted from a shelter, according to one official on the scene. 1Calling this red-nosed pit bull terrier a "pit bull-mix" is totally inaccurate. 2Included in the repeal was a "loosening up" of how shelters adopt out pit bulls picked up by the city. 3We learned Friday (12/14) that although the address of the dog owner, 5831 SE Cross St, lies in Topeka, this area is under the jurisdiction of Shawnee County, not the City of Topeka. Repeal of BSL is proving to be a bad idea. Topeka repealed BSL, a baby is killed by a pit bull. Ohio repeals BSL, three DBRFs in the first few months. Cincinnati Ohio repeals its BSL, just weeks later a grown man is killed by his designer dog/pit bull mix. When will lawmakers consider the safety of the public from a known danger over the shrill demands of breed specific advocates? I think it will be hard for anyone to say that this was an "unforeseen accident". Apparently at one time this community had good sense, only to be won over by then nutters. the law just needed to be kept in place. In my opinion those that participated in the 9-0 vote to repeal it are just as responsible in this poor baby's death. I wonder what legal responsibility the shelter as- or can legally be made to take- in selling dangerous dogs that wind up killing people. It's time for Topeka to tighten up its regulations. And, by that, I mean make them stricter than before the repeal. This poor child paid with her life, and this needs to stop happening. Now! "Exactly in what neighborhood in the U.S. is a dog-aggressive pit bull — "would attack other dogs if given the chance" — appropriate?" As someone who has dealt with the typical pet owner in dog training classes I can tell you that not ONE of them that I have ever encountered in the last 7 1/2 years is capable of having a dog like that. There is no reason for someone to own a pet like that. There is no legitimate reason to want to own a pet like that. The worst thing is that those people who have them still want to inflict that dog upon the public as if its their right to take it out and even take them to off leash dog parks. I am so sick of the mantra that "human aggression is different then animal aggression". To me that one makes me just as crazy as the "how you raise them" BS. I don't think any animal aggressive dog should ever be sold from any pound or rescue, for them it should only be a one way door into the facility. I agree with Putme Incharge. Putme Incharge should be in charge! S/he's absolutely, utterly right.